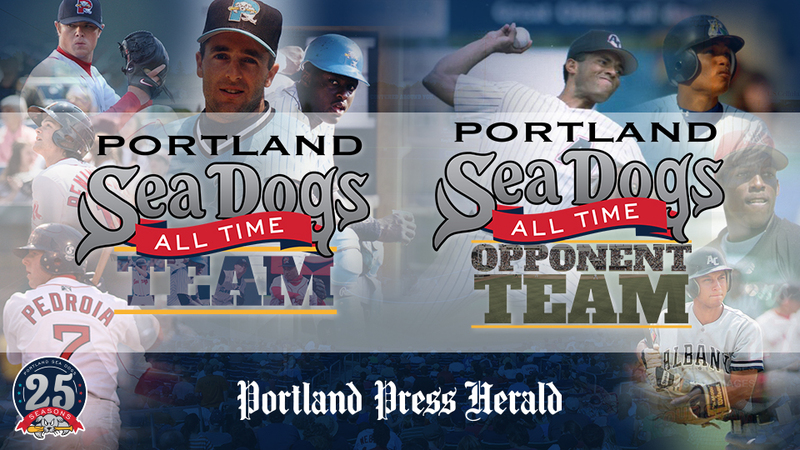 Portland, Maine- The Portland Sea Dogs in conjunction with the Portland Press Herald is proud to announce the All-Time Sea Dogs and Opponent teams. In celebration of Portland's 25th season, the All-Time teams were voted on by the fans, via seadogs.com and the Portland Press Herald. Charles Johnson (1994)…On April 7, 1994, Johnson hit the game-winning homer in Portland's 2-1, 14-inning win at Reading - the first game in team history. Johnson hit .264, 28 HR, 80 RBI in 132 games with Portland in '94, he went on to play 12 seasons in the Major Leagues with Florida, Los Angeles Dodgers, Baltimore, Chicago White Sox, Colorado and Tampa Bay. Johnson won five Gold Gloves. Kevin Millar (1996-97)…Millar holds the franchise single-season and career marks in the following categories: Average, Hits, RBI and Total Bases. In '97, Millar hit .342 in 135 games with 32 homers and 131 RBI, capturing the Eastern League Most Valuable Player (only Sea Dogs player to earn that honor). Millar hit 50 career homers with the Sea Dogs and played 12 Major League seasons with Florida, Boston, Baltimore, and Toronto. Dustin Pedroia (2005)…The Sea Dogs Hall of Famer made quite the impression in just 66 games with Portland in '05, hitting .324, 8 HR and 40 RBI. Pedey has a mainstay as Boston's second baseman, as he's played 12 seasons in the Majors. In 2007 he was named American League Rookie of the Year and won the 2008 American League MVP. Kevin Youkilis (2003)…Youkilis is on the ballot for both the Sea Dogs and opponent All-Time teams. Youk hit .327 in 2003, the third best single-season average in team history and holds the team record with a .487 on-base percentage. Youkilis hit .281 over a 10-year Major League career and was part of two Red Sox World Series teams (2004 & 2007). Hanley Ramirez (2004-05)…Ramirez was the Top Prospect in the Red Sox system in 2004-05. He played in just 20 games in 2004 but was an All-Star in Portland's terrific 2005 season. Ramirez was part of the Mike Lowell trade and has appeared in over 1,600 Major League games. In 2006, he was named the National League Rookie of the Year. Andrew Benintendi (2016)…Benintendi played so well for Portland in 2016; he was promoted to the Boston Red Sox right from Double-A. The Cincinnati, Ohio native hit .295, 8 HR, 44 RBI in 63 games with Portland. Jacoby Ellsbury (2006-07)…Ellsbury dominated in his short Double-A stints with Portland, contributing to the 2006 Eastern League Championship, and was a member of Boston's 2007 World Series championship. Currently, Ellsbury enters his 12th Major League season with 343 stolen bases in his career. Brandon Moss (2005-06)…Moss is known for his two famous plays in Game 4 of the 2006 Northern Division Championship. In the ninth inning, he threw out a runner at the plate and in the home 10th, he hit a walk-off homer, sending Portland to the championship round. The Georgia native played 11 seasons in the Major Leagues with Boston, Pittsburgh, Philadelphia, Oakland, Cleveland, St. Louis and Kansas City. Moss was named to the American League All-Star team in 2014 and hit three career homers in the post-season. Josh Beckett (2001)…Beckett was sensational in just 13 starts with the 'Dogs in '01, going 8-1, 1.82 ERA and named the Baseball America Minor League Baseball Player of the Year. Josh pitched with the Marlins and Red Sox and was a post-season MVP for both teams. Beckett pitched 14 seasons in the Major Leagues, finishing his career with the Dodgers. Jonathan Papelbon (2005)…Papelbon was a starter in Portland and earned the win on Opening Night in 2005, as the Sea Dogs won their first ten games of the season…A six-time All-Star, Papelbon had 368 career saves in 689 appearances with the Red Sox, Phillies, and Washington Nationals. Jon Lester (2005, 07)…Lester's 2.57 career ERA is the best in team history. He went 11-6, 2.61 ERA with the Sea Dogs in 2005, earning Eastern League Pitcher of the Year. Lester was part of the two Red Sox World Series winning teams (2007 & 2013). Daniel Bard (2008, 2013)…Bard is known as one of the first Sea Dog as a Red Sox affiliate to hit 100 mph on the Hadlock Field stadium gun. He dominated in 31 games in '08, posting a 1.99 ERA in 31 games with seven saves. Carlos Tosca (1994-96) - First Manager in team history, compiling a record of 229-195 (.540). Tosca was inducted into Sea Dogs Hall of Fame in 2005.